Norman Rockwell Easter paintings perfectly capture the spirit of our favorite spring holiday. 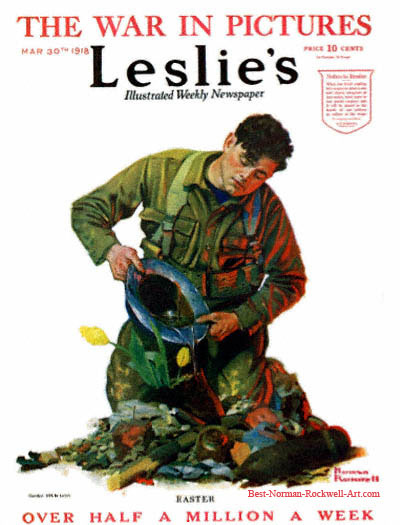 During his time as America's favorite illustrator, Rockwell painted Easter scenes many times. This gallery of Norman Rockwell Easter paintings will be spread over several pages. Please contact me if you have any suggestions. Norman Rockwell perfectly depicts the wonderful feelings imparted by attending worship on Easter morning. All three characters are decked out in their finest. Mother and daughter are wearing new hats, decorated with spring flowers. 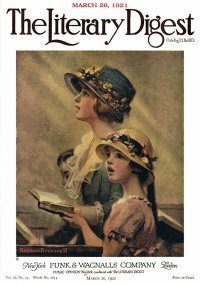 Both ladies in the picture are singing along with the hymns. Mother is looking up as she sings. Light streams through the stained glass windows, illuminating her face and filling her emotionally. She welcomes the feelings. The daughter apparently is feeling some of the same emotions. She appears somewhat unfamiliar and even confused by the sudden rush of emotion. The boy, who is not joining in, appears unmoved. This painting was the only Easter painting to appear on the cover of The Literary Digest. This painting portrays Easter 1918. Norman Rockwell frequently painted scenes showing World War soldiers and sailors coping with being away from home. No doubt, this soldier misses his family and going to worship on Easter morning. And yet, he is worshipping in his own way. Did you notice the coloring on his left (our right?) There is red and orange reflected to us on his uniform. It would appear that either a fire or some kind of explosion is happening over there. Rockwell is reminding viewers then and now that, no matter what else is happening in the world, Easter is coming anyway. No matter what terrible things man does to man, whether in the name of religion, hate or even just plain greed, Easter is still coming .